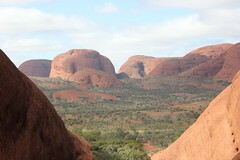 A trip to the Northern Territory. Part 7. Heading west out of Alice Springs on Namatjira drive you are soon in the heart of the Macdonnell Ranges. We went past places like, Standley Chasm, Simpsons Gap, Ellery Creek Water Hole and then we pulled up at Serpentine Gorge. All these places by the way are easily accessible from Alice Springs as Day trips, quite handy if you don’t want to camp out in the wilds! The Macdonnell Ranges run for about 640 odd km’s east and west of Alice Springs. Parallel ridges on either side of the valley are quite visible and in these ridges there are gaps which provide spectacular scenery and beautiful waterholes to cool of in the middle of summer. The Ranges were green from recent rain which really made them standout amongst the surrounding landscape of red and ochre desert colours. 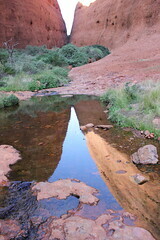 If you want to learn more about the Macdonnell ranges click HERE. 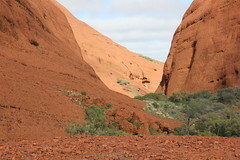 Serpentine Gorge was created by a south flowing creek which has cut through two ridges of Heavitree Quartzite leaving a spectacular gorge. The road in is not too bad for a dirt road and once you get to the parking area it’s about a 1.5km walk in to the gorge across dry creek beds and scrubland. If you’re lucky and are here after rain there are lots of wildflowers to see. I was the one lagging behind taking photos of plants and flowers as the rest of the family steamed ahead to the heady heights of the gorge lookout. 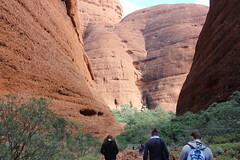 Now if you want to see pictures of Serpentine Gorge in all its glory, I’m not going to show them right now! You will need to scroll through this post to find them, cruel I know but well worth it! Here is one of the dry creek beds, very rocky as you can see. This is what a lot of the surrounding plant scape looks like, uninspiring you may say but you just need to look closely to find its beauty. Larapinta trail marker, this walking trail is 223km in length across the Macdonnell ranges, click on this link, maybe one day! If you’re walking too fast you will miss this little plant. 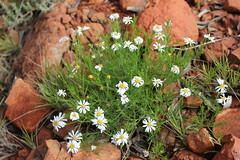 Brachyscome ciliaris also known as Variable Daisy is found in all states of Australia and usually in sand and gibber plains(extended plain with loose rocks). Grows to about 45cm. Brachyscome quite often seen in nurseries and gardens around the country even more exciting to find it out here! Remember! Don’t just look ahead, cast your eye’s down and to the sides of where you’re walking, you’ll never know what you will find or see next. Above is a couple of more photos of this little gem. Now, what about some Nightshade! Solanum quadriloculatum. That’s a mouthful, Wild Tomato sound better? Be very wary, this plants fruit are poisonous, another reason why common names are misleading. This plant grows to 50 x 50cm near flooded watercourses and or low sand dunes. 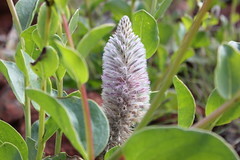 It’s quite prickly and flowers in winter and spring. Below is Senna artemisoides subsp. artemisoides, another mouthful but a very beautiful shrub which grows to about 1-2 metres with beautiful yellow buttercup flowers in winter and spring. Maybe you can just call it the Silver Cassia. Now for an Emu Bush. Eremophila latrobei , commonly known as the Crimson Turkeybush, click HERE if you want to read more about this plant. Quite beautiful! Another stunning Emu bush is Eremophila longifolia , also known as Berrigan, tall shrub to small tree weeping in form, click HERE if you want to know more about the Berrigan. Sorry, I got distracted with the plants in the Serpentine Gorge, lets move onto the scenery. This is the first sort of glimpse of the gorge and it looks like its sort of straight up to the top, hmm! Lets go for it! Now we are starting the climb up and here you can clearly see the parallel ridge lines that run through the Macdonnell Ranges. Yes, as you can see above we are getting higher, quite spectacular! It is quite a rocky landscape and on these hillsides there is a lot of Porcupine grass, Trioda irritans. The last past of its botanic name sums it up very well indeed, very irritating because it’s quite prickly. Below are more views across the valley. Another plant of interest for me to see in the wild was Dodonaea viscosa , the Broad leaf Hop Bush or just plain Hop Bush, very common in gardens around the country and useful for many things from hedging to specimen plantings. It’s a very variable plant in the wild and widespread across the country. Now I know photos are great but there’s just no comparison to actually being there and seeing this landscape. I have a great digital SLR camera but it doesn’t capture the WOW! The size, scope and detail of what your eyes are looking at or what your feeling right then and there as you look at this amazing country. 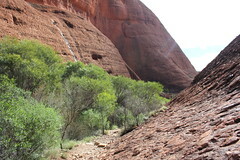 Below is the Serpentine Gorge. Where does one go now from these heights? Down one would expect and lo and behold something I missed on the way up nearly hit me fair and square in the head on the way down. Leaning over the rocky pathway was this intriguing large shrub with what looked like stems twining around themselves like a climbing plant. This is Pandorea doratoxylon also known as the Spearwood Vine. The Aboriginal people use this plant for spears hence its common name. The long twining stems are light weight and are straightened and hardened over a fire. The flowers are quite pretty when one comes upon them in such a tough landscape. If they look familiar to you, you may be thinking of Pandorea jasminoides the Wonga Wonga vine or also known as the Bower Vine or one of the many hybrids available today. You would be correct because they are in the same family Bignoniaceae. Check out this closeup below! This next photo doesn’t show too much, I just liked the detail of the bark. To me it tells a story of the harsh landscape in which it resides. These next photos show an interesting Grevillea, the Holly Leaf Grevillea, Grevillea wickhamii. There are a few sub species but I’m not sure which one this is. I have pictures of this flowering at a different location which will be revealed at a later date! You can see above that the new growth gives the plant a tinge of yellow which from a distance look like flowers. Some more plants of interest here included another beautiful Emu Bush, Eremophila freelingii. The Rock Fuchsia Bush. A characteristic of this plant is that it sheds its lower leaves during drought to conserve moisture, you can see that quite clearly in the above photo, the plant looks half dead but it’s not! Grows to about 1.5 metres. The lilac flowers are stunning and are produced after it rains. Just a few more views below of this beautiful plant on the sides of Serpentine Gorge. Funnily enough another surprise was what looked to be some type of Fern here as well and yes it was. Not sure of its identity but quite possibly Cheilanthes brownie , The Northern Rock Fern, either way still remarkable to me to see a fern out here. Nature is amazing. Another interesting plant we saw was a parasite. Lysiana exocarpi , the Harlequin Mistletoe. This parasite is found mostly in inland locations and is very colourful. Now we have made it back down and headed into the cool of the gorge, being winter it wasn’t hot out in the open so one could imagine how nice and cool it would be in the heat of summer. In the above photo in the distance you can see some cycads, Macrozamia macdonnellii , the Macdonnell Ranges Cycad. Here they are below as well. Ah well! 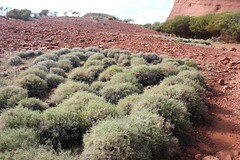 That’s about it for the Serpentine Gorge, here’s a few last photos of plants and foliage. Lets have some lunch, its been a great morning in the Macdonnell Ranges. Serpentine Gorge has been a truly magical experience. Finally a last look into the gorge. 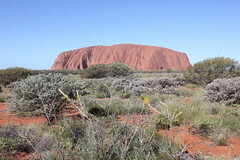 A trip to the Northern Territory. Part 6. As our time in Alice springs starts to come to an end, our thoughts turn to the Macdonnell Ranges which are our next destination, but before that we spent an afternoon at the Old Telegraph Station situated beside the Todd River, a mostly dry river that runs through Alice Springs. Here we caught up with a friend from our old Melbourne days, the mountain bikes got ridden(finally) and a dingo made an appearance. Luck would have it that the week before we were in Alice Springs they had a huge storm which put some water into the Todd river. All that was left were a few puddles, so we got to see the Todd with a smidge of moisture in it. Here’s the Todd River in all its empty glory! Yes it is empty, this is only some puddles that are not moving. Some of the kids having a ball in the puddles. The mountain bikes getting a run, and a soggy crossing! Here’s the dingo stalking a galah….. Missed it.. ah well, there’s always next time. One of the many quirky things in Alice Springs is a Beanie Festival in June. Yes I get it, its winter time and yes it can get cold in Alice Springs in winter time and the desert gets cold overnight, but!! Well that’s just another whole level of Irony right there! It was fun though!! Sorry some of these are blurry but they just had to be included!! Here’s some more views of the Todd River sans water. Well maybe just a smidgen of water. The parting shot of Alice Springs for this post is from Anzac Hill. A memorial to the ANZAC’S on a small hill one end of town. The view was quite something. Thanks “ALICE” it was a blast! !